This is my very first experience in planting sweet corn. Due to space limitation, i only planted 2 short rows with 6 seedlings but only 4 managed to survive. 31 December 2010 (15 days) Sweet corn and kailan as companion. Tassels were developed after about 50 days. 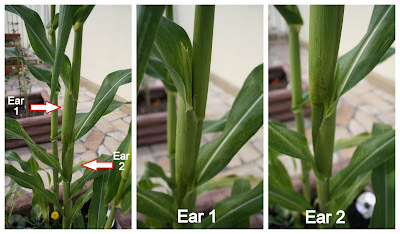 5 February 2011 (51 days) Ears came 4-5 days later after the tassels were seen. One of the stalks had multiple ears. Mini-me demonstrating how to hand pollinate the corn. The plants suddenly grew so tall, after tassels were out. They had already reached 8 feet when this pic was taken, compared to only 3-4 feet 2 days ago! 6 February 2011 (52 days) While the tassels were getting matured, the ears continued to grow bigger. Ooo i love the touch of the silk hehe. 18 February 2011 (64 days) After "laying by the corn" (the process of adding soil to the roots), i transplanted 3 bean plants (kacang buncis / 乌龟豆) to here. The corn stalks become the natural trellis for them. Ears were getting bigger and silks were getting darker approaching to harverst. The weird one, this plant with multiple ears had no silk! How come?! This bothered me a lot. Were they growing correctly? Were there kernels inside? 22 February 2011 (68 days) Another weird one here. Do you call this 1 ear? 3 ears? Or triplet?? The 2 little side ears came out late, when the middle big one was almost time to harverst. Is this normal?? So all together i only had these from the harvest. Duh... (don't laugh nah!) Haha. The 2 baby corns went into my lunch, chow-mein (fried noodle). Delicious and crunchy. The other 2 'normal' corns were steamed and eaten too. Never had i tasted such sweet and nice corn before! There honestly are no words to describe the sensation of eating corn that fresh. That was really a moment to remember! Although i didn't have much harvest this round, but i will definitely love to plant more next time. It gave me deep satisfaction in watching them grow and come to fruition, and then eat the fruits of my labours. And my little assistant enjoys shaking the stalks a lot too! Haha. The only thing i must not forget is not to be stingy on fertilising the plants to give me big fat corns next time! Wah you harvested your sweet corns already! How do you hand pollinate them by shaking the whole plant? Never mind its the first harvest, next time you will do better since you got the experience. So after harvesting them, do you pull the plant and start planting new one? The chow mein looks so delicious! p3chandan: I saw you have corns in your garden too ^_^. You can polinate the corn by shaking the stalk and let the little brown thingies fall on the silk (do this preferrably in the morning). I let the stalks be there as trellis for my beans at the moment. Later if they are not in use anymore i'll bury the stalks- i read that they are good as fertilizer. Next round i will plant my corns in different bed, not in the same bed as this will bring the soil into bad condition. Speak like an expert but all info are from my previous readings, haha. Nice corns, looks really good in your delicious noodles. 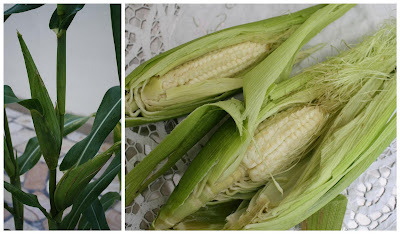 I am not successful in growing corn, will have to try again in the future! How come I could not link to your post of komatsuna? At my side bar, shows your post as komatsuna, when I click on it, it leads me to your corn post! Wakaka! You did expect me to laugh, didn't you? I hand pollinate by physically transferring the pollens to the tassels with my fingers. I wanted to be sure the pollens reached the right places because my first corn only had 5 grains! Wah! good harvest of corn for 1st timer! Mine taken by monkey in early ear stage!! really sakit hati! kitchen flavours: Sorry about the post, i've deleted it. One: After shaking the stalks i also transferred the pollen by hand to the silk. 99% sure is pollinated but how come only few grains? I don't understand. Malar: Monkeys used to kacau in my parents house too, even took down the car side mirror and went into the house to berak everyday. My mum inject the fruits with 'sleeping pills' let them eat and mabuk and catch them successfully. Look like you have so much fun with growing sweet corn;-).Boleh tahanlah with your first harvest very banyak and the inside almost full. Wow your sweet corn very tall. The one I currently growing baru sampai my peha already start to have tassle and ear don't understand why. Last year also like that just over 1 metre tall. Sweet corn is a very greedy feeder and thirsty plant. They need all of this to produce good cobs. LOL. Sleeping pill for the monkey. great idea but the one that been coming to my parents house don't eat the fruit they just break the plant. My mama also pening kepala. Fun in seeing the growing though not too many. With kids involved, it's a parent-kid time. How precious and delicious ! 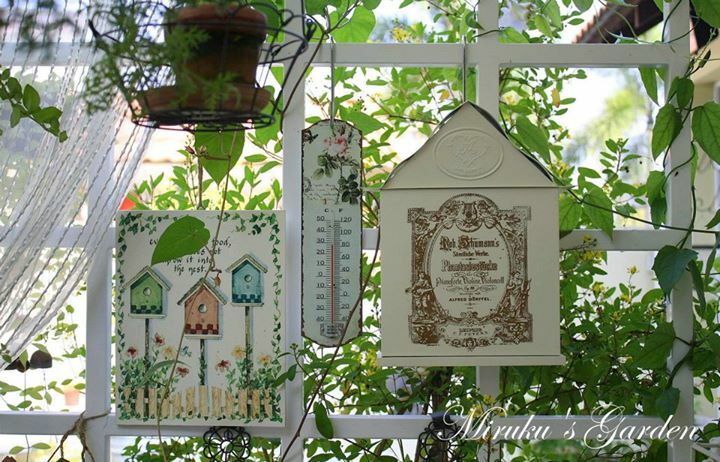 I love how you are sharing your gardening experience with your daughter. I love fresh corn from the garden. There is nothing like it. Mini-me is soooo cute! Wow.. and your corn looks interesting! And sweet! I am so excited to see your corn growing well and tall and you have even tasted the fruits of your harvest. Wow, makes my fingers itchy to grow corn in my garden too. 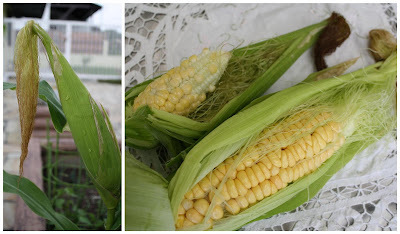 A great diary of the life of a sweetcorn plant! Almost like "Time-elapse photography". Hahahahaaa... sorry I had to laugh... your account is so amusing, really... but some harvest is better than no harvest... congrats! 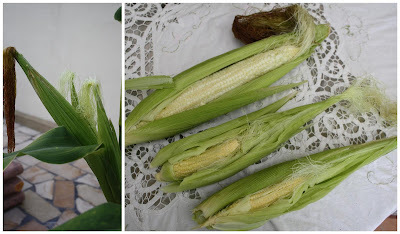 Fun post about your corn growing! And such a cute little mini-you. She is learning a lot from you, you are planting seeds of discovery! Milka, You asked me why I have many photos of nature once. Today I reply to you in a post. Milka, just to let you know that I can mail you the Mt Fuji morning glory seeds if you would like to have them. Click reply to this message in your inbox...if you are reading from your inbox.